“Nishijima meat corporation began over 80 years ago near Araiyakushi temple in Nakano, Tokyo. We select Kuroge Wagu including Matsusaka beef, Omi beef, Hitachi beef and Miyuki beef from markets at least twice a week, which enables us to offer premium A5 grade Japanese beef “Kuroge Wagyu” with reasonable prices. Nishijima meat corporation implements integrated purchasing-to-processing system. We select and procure one whole cow and process all the parts within our facility. This allows us to fulfill all our customer needs, together with shorter supply chain that gives cost advantage. Moreover as all the process is done by our facility, we are confident on what we offer! 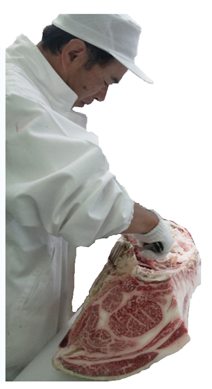 Selection of meat, cutting skills, quality control,,, we have expertise in this business cultivated by several decades of experience that we believe to be the best. “Good Timing to serve” is also one of important factors for our customers, and this is why we offer “Aging beef”. We keep in our refrigeration facility where the time is controlled based on our original standard. Each mouthful will be of the exceptional quality our customers have come to expect. It may sound cliche, but we set much value on ”Good Quality & Good Price” by the founder’s precept. Our commitment, is to offer you the excellent products without compromising the quality. Please check here to confirm. We will send the mail to your registered address. Copyright © 2019 株式会社 西島畜産, All rights reserved.